October 31, 2017 - Irvine, California - Skyworks Solutions, Inc. (NASDAQ: SWKS), an innovator of high performance analog semiconductors connecting people, places and things, today introduced a new family of highly integrated wireless networking solutions for mobile and Internet of Things (IoT) ecosystems. 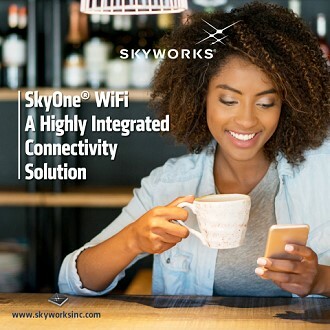 The new SkyOne® WiFi suite combines Skyworks' industry-leading integration expertise and advanced 802.11ac technology to provide customers with a comprehensive front-end module in a single placement, compact footprint. Specifically, these new products incorporate all key radio frequency blocks between the Wi-Fi system-on-chip (SOC) and the antenna, unburdening customers of complex RF design challenges, while reducing time to market. This unique platform significantly improves the Wi-Fi system performance when compared to other standard SOC platforms and further mitigates interference with other radios, extending range and increasing throughput to greatly improve the user experience. The SKY85812-11, the first in the SkyOne® WiFi series of products, is currently shipping in flagship platforms globally with a top tier smartphone OEM. "Today's mobile and IoT devices are now supporting up to 20 bands and require both seamless and robust Wi-Fi functionality to meet growing requirements from carrier offload, voice over IP and other bandwidth-intensive applications," said David Stasey, general manager and vice president of Diversified Analog Solutions at Skyworks. "Building upon our highly successful SkyOne® cellular platforms, Skyworks is now pleased to offer Wi-Fi solutions that deliver optimum levels of integration and performance." According to ABI Research, more than 20 billion Wi-Fi chipsets are expected to be shipped between 2016 and 2021, particularly as Wi-Fi solutions expand beyond their traditional usage applications, frequency bands, device types and performance requirements. They also expect more than 95 percent of devices shipped in 2021 to support 5 GHz Wi-Fi, signifying increased spectrum sharing with cellular technologies. The SKY85812-11 is dual-band front-end module incorporating a 5 GHz bypass low noise amplifier with single-pole, double-throw transmit/receive switch and a 2.4 GHz bypass low noise amplifier with single-pole, triple-throw switch with Bluetooth® port that allows for Wi-Fi antenna sharing. The SKY85812-11 also includes a 2 GHz LTE coexistence filter and diplexer - all designed into a compact, 16-pin 3 x 3 mm package. Skyworks' SKY85812-11 is currently available for sampling and production. For more information, please visit Skyworks' Wi-Fi Connectivity FEM page or contact sales@skyworksinc.com. Any forward-looking statements contained in this press release are intended to qualify for the safe harbor from liability established by the Private Securities Litigation Reform Act of 1995. Forward-looking statements include without limitation information relating to future events, results and expectations of Skyworks. Forward-looking statements can often be identified by words such as "anticipates," "expects," "forecasts," "intends," "believes," "plans," "may," "will" or "continue," and similar expressions and variations (or negatives) of these words. Actual events and/or results may differ materially and adversely from such forward-looking statements as a result of certain risks and uncertainties including, but not limited to, our ability to timely and accurately predict market requirements and evolving industry standards and to identify opportunities in new markets; our ability to develop, manufacture, and market innovative products and avoid product obsolescence; our ability to compete in the marketplace and achieve market acceptance of our products; the availability and pricing of third-party semiconductor foundry, assembly and test capacity, raw materials and supplier components; the quality of our products; and other risks and uncertainties identified in the "Risk Factors" section of Skyworks' most recent Annual Report on Form 10-K (and/or Quarterly Report on Form 10-Q) as filed with the Securities and Exchange Commission ("SEC"). Copies of Skyworks' SEC filings can be obtained, free of charge, on Skyworks' website (www.skyworksinc.com) or at the SEC's website (www.sec.gov). Any forward-looking statements contained in this press release are made only as of the date hereof, and we undertake no obligation to update or revise the forward-looking statements, whether as a result of new information, future events or otherwise.